By the time that you are reading this, I will have taken two long flights in relatively close proximity: I will have flown back from the West Coast with my family and flown to Paris without them. Being 6’4″, I really hate flying–there is never enough leg room and there is always at least a couple of people that tick me off to the point of not being able to get any sleep. Once again I made it into first class thanks to my wife, who flies many more miles than I, but refuses to take any upgrades that come her way. Instead, she insists that I take the much improved flight experience. I protested again, to no avail–I guess that is one of the advantages of being 6’4″ and married to a saint. As I took my seat, the flight attendant came over and asked me if I would like something to drink–It was only 10:30 in the morning in San Francisco, but I felt like I should have a glass of wine since it was 1:30 in Philly and frankly, it is very hard for me to pass on free booze. I knew the wine was going to be horrible, but then so was the flight and misery loves company. As I was still contemplating whether to feel guilty or not for ordering wine before noon locally, the guy in front of me ordered a Vodka Gimlet for himself and a glass of Chardonnay with ice for his wife. The flight attendant was a bit taken aback and said “Ice? Do you mean ‘no ice’?” The guy quickly countered that his wife had to have ice in her Chardonnay, or she would not be happy. I was about to add that I would rather have a fly in my Chardonnay but I felt that would be too “ironic”. The wine came and it was, well, pleasant. No one was more surprised than I (although I did not ask ice-cube woman her opinion). 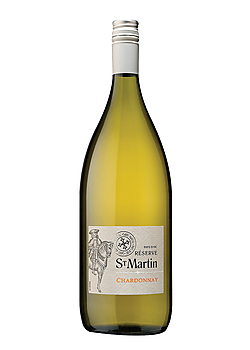 In fact, I even asked to see the bottle: St. Martin Reserve Chardonnay from the Pays d’Oc in Southern France. Not the most complex bottle of Chardonnay that I have ever had, but for the price ($9 retail and “free” in First Class) it was tough to beat. I sat there with my wine, watching people board the plane, which I think is one of the odder social phenomena: people who would love to be in First Class are paraded by those who are fortunate enough to be there. Both sides awkwardly avoid any sort of eye contact, much more so than if the interaction were between two people from the same “class”. As a First Class passenger am I supposed to take pity on them or ignore them as “Second Class” citizens? As a Coach Class flier am I supposed to envy them or laugh at them for having paid 3-4 times the price I paid for a little more leg room and some really cheap Chardonnay? I find the whole thing rather bizarre. When the meal order was taken (another perverse practice–“Would you like the crappy chicken or the perhaps crappier ‘vegetarian’ option?”), Ms. On-the-rocks decided to try and change it up a bit and asked if there was any Pinot Grigio—I guess the iced down Chardonnay still had too much flavor for her. Informed that there was nothing more tasteless than the Chard, she ordered another–with double the ice. I have a habit of chatting up the flight attendants (my wife calls it flirting, but that has yet to be independently confirmed) and when our lovely attendant Amelia came by to take my lunch order, she seemed playfully perplexed when she asked if I were “Mr. Kim”. (My wife’s name is not “Kim” but she felt weird having her real name on my blog. Additionally, Asian is not one thing that anyone would ever confuse me for, but I was technically in my wife’s seat–at least the attendant recognized a gender difference). When I gave her the whole story, she asked if she could have my “real name” and I spelled it out for her—to which she responded “Well, welcome Mr. Cyclist.” I indicated that it was actually “Dr. Cyclist” and that I would love her forever if she called me “Dr.” at least once. For the rest of the flight, Amelia only referred to me as “Doctor”, and she had ample opportunity as I was sucking down the glasses of St. Martin almost as fast as she could pour them. Being the dutiful husband, once we landed, I waited for my wife and boys. As we passed by Amelia, she said: “Goodbye Dr. Cyclist” and then paused and added “Goodbye Mrs. Cyclist.” At this, I looked back and smiled as Amelia gave me a wink. 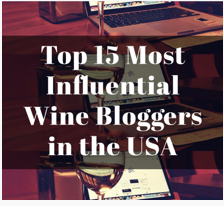 This entry was posted in Chardonnay, Travel, Wine. Bookmark the permalink. Don’t even know what to do with that Avril thing. I died laughing, especially since she’s not the one who said that. Oh, and very well played Frank, well-played! I’m not as tall as you but I’m very well built so I won’t fly long distance in economy class any more. Did the long haul from London to Auckland in 1st on honeymoon, the wines selection was great! Ah, the trappings of success! I wish…generous contributions to our honeymoon fund! Ha! I guess I lump them together…. I was going to leave it–being the idiot I am, but I figured most do not read the comments….. The advantage of becoming pals with flight attendants is that they come across so few people who are courteous to them. In turn, they’ll go that extra ole for you. No pun intended, but this rule applies anywhere. Be kind to your fellow man. He may be God in disguise. I meant “mile” not ole. Damn auto correct strikes again. Well, at least you did not incorrectly identify a singer in one of you side rants…. It really is easier to be nice–I don’t get it some times…. try Alanis Morissette; and this was hilarious; love the ending! Yeah, thanks. Changed it but not soon enough. They are pretty much the same anyway as far as I am concerned….. I had to laugh at the end. Nice!!! I am glad someone found it funny! Ha! It might take a while! Great post! Hysterical as usual. Could agree more about standing up on a plane, use your core people! I had a surprising decent Bordeaux last week from Dallas to Frankfurt. I looked at bottle but no longer recall the name. Thanks for the post Dr! (I am contemplated a phD but am now leaning away from it. Just finished Masters and not sure I can take another 5 years of laying on the ground with a heel firmly implanted into the side of my throat/face. Thoughts?) Enjoy France! I would say the Ph.D. has been mostly for personal gratification at this point. Sad, but true. It has opened a few doors, but unless you are going into academia, there seems to be no real benefit. Unless people start calling me doctor…. Fabulous humor to start my day … and the slapping ending is perfect. … well, for the humor. It was actually pretty funny, even the ending…. First class, cheap wine, flirty flight attendants and irony – fabulous post Dr.
Why thank you (and of course you know you get extra credit for use of the title…)! And you wonder where Sebastian gets his wit from. Just be glad that they did not need the assistance of a doctor on the flight, or a bottle of Champagne opened. A charming store as always. While I would love to take credit for Sebastian’s unique views on the world, they are certainly all his own. Thanks for the kind words, as always.